Select a role from the Role dropdown list. Check/uncheck the privileges you wish to assign/unassign to that role. Heads Up! The roles set for the Admin group and Standard user's group in Security Settings are automatically managed, so any changes you make to their privileges will not hold. Click the search icon to expand the search field. Start typing the name of an app, privilege or keyword. The list will update to show matching items. 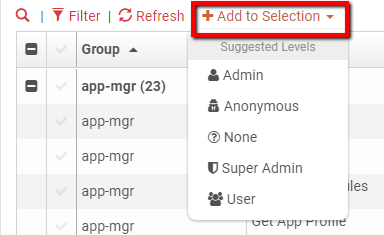 The Filter options lets you filter the groups, privileges, suggested levels, and/or descriptions you want shown in the list. Enter the criteria for the groups, privileges, suggested levels, and/or descriptions you want filtered into the applicable box. Tip: Click Filter again to close the filter and refresh the privileges list. The Add to Selection option lets you filter to list by suggested level. Select a level from the dropdown. The list will update to show all privileges that match the selected level. You can filter the privilege list by group. Click the checkmark in the table header to check all items in the list at once. Click the checkmark in the table header again to uncheck all items in the list at once.